I spent this morning cleaning out my frig and freezer and getting some string beans blanched for the freezer. Since I'm leaving for Ontario tomorrow, I wanted to take care of some of the fresh veggies. I froze some and picked some for supper and to leave for my husband to eat while I'm away. Hopefully, he'll hear about any frosts and cover the tomato plants. He usually does. 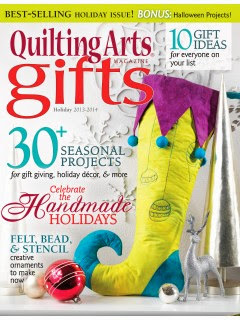 When I checked my mail, I was surprised to find my copies of the Quiting Arts Gifts magazine that has my article with directions for my snowflake table topper. I will save the reading for later, but of course I had to take a quick peak at the photos. I really love how they photographed them! 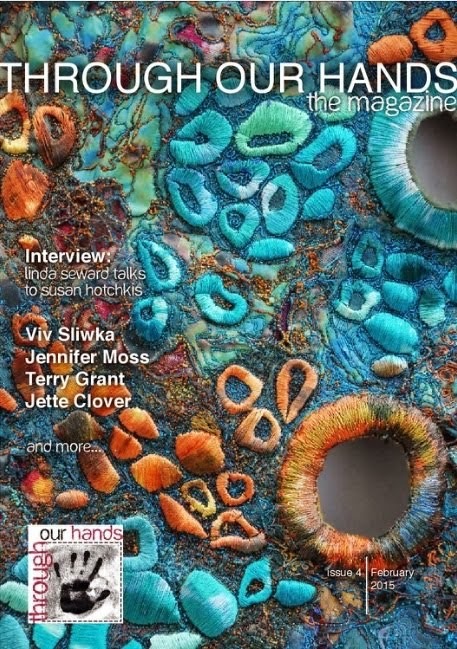 For info on the magazine you can click on it on my sidebar. As a little distraction from my impending voyage --aren't I silly to get anxious? I don't get out much-- I fused and cut a few pieces for my little landscape just to get an idea of how it will look. There will be a gravelly foreground which I didn't cut yet. Also, I think I will cut the green foliage back quite a bit lower and into more branches/leafy shapes allowing for me to thread paint leaves and such in which the background water will show through. I'm happy with the colors, but of course the addition of thread painting with different values should make quite a difference. It will give me something to think about during my travels and I'll have something to look forward to when I come home next week. I have to think about the framing. What I have in mind is to add a metered boarder before I actually start the thread painting so that it will all be backed with an interfacing. It will be quilted as a one pieced wall hanging. So you likely won't see a post from me for about a week unless I get onto a WiFi network. I'm making a trip to my nieces wedding in Oakville this Friday and then I'm going to visit with 2 aunts in London, Ontario. Since I don't want to take my good camera with me (it's too large to drag around), I needed a camera case for a little one that I have. 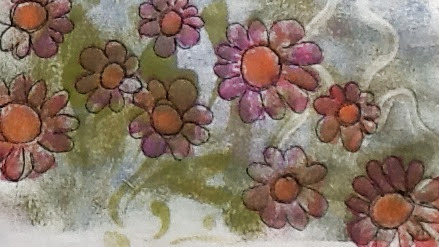 I rummaged through my basket and found a piece of canvas that I painted with a soy resist and took it to my paint table for a bit of stamping. I dried it quickly on the line, ironed it and free motion quilted it. 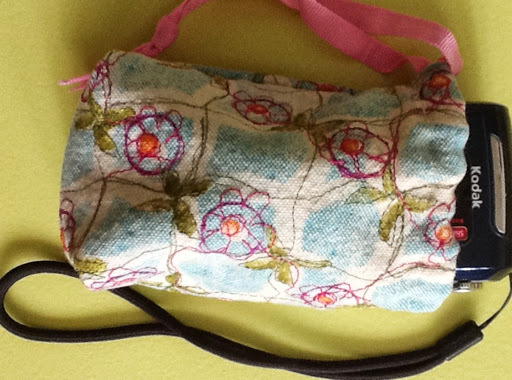 It didn't take long to stitch up a little bag and add a draw cord. Perfect to add to my purse. 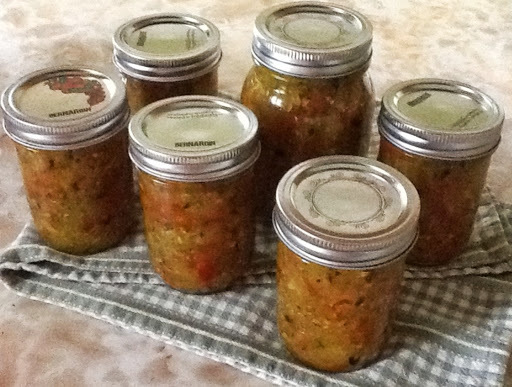 The mom of my son's fiancé gifted me a bottle of her zucchini pepper relish some time ago and my husband and I love it. Since it is almost gone, and it's zucchini season, I decided to make a batch. I grabbed a recipe that seemed similar from the net and got to work this morning. These are the results. It should keep us going for a while. We use it on veggie burgers, occasionally veggie dogs and in sandwiches. So good! 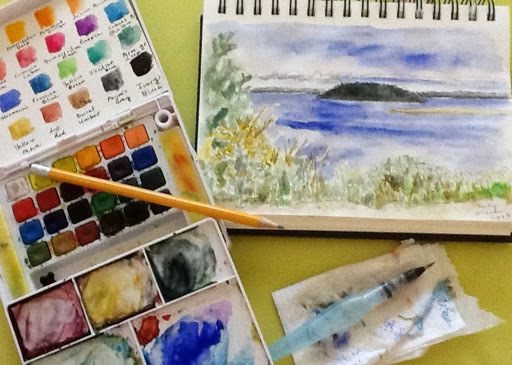 After lunch and a bit of a rest, I decided to try painting a couple sky and waterscapes for my next project. I did two about 8 by 10. It's still a bit damp in the photo, so darker than it will end up. 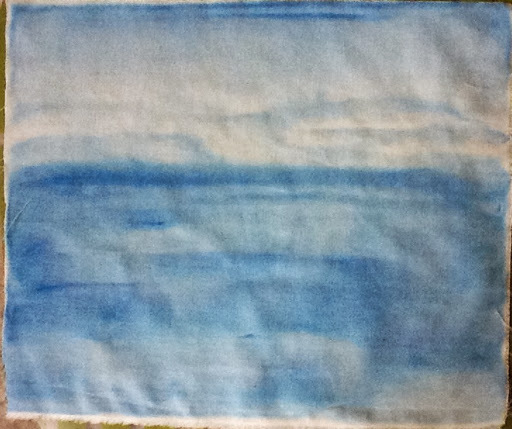 Being aware of how much the paint will fade as it dries, I tried to use it quite saturated, so we'll see. I will use it anyway, as I have photos of the scene taken on different days and the colors are quite different in each one. I'm going to attempt the scene from the sketch of in my last post. 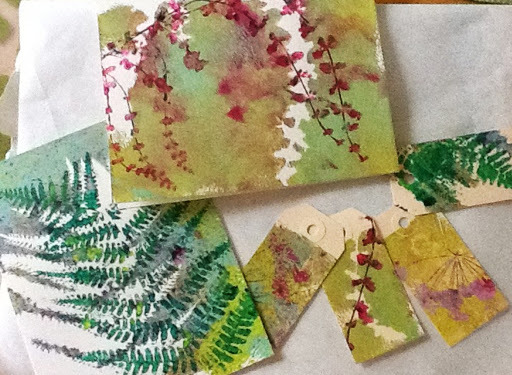 While I was at my painting table, I thought I'd have a go at adding another printed layer with plant materials and acrylics onto some cards and tags that I had deemed rejects from my last Gelli printing session. I kind of like that top one. 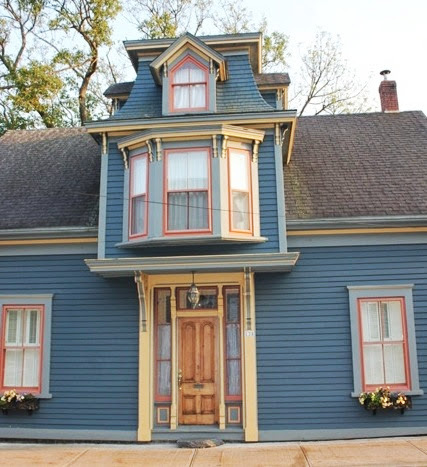 Would you believe I used Russian sage for that? Yesterday, on my way to pick my husband up from work, I had a few minutes to stop and snap some pictures of Indian Island which sits in our downtown waters. I've just done a quick study of it. 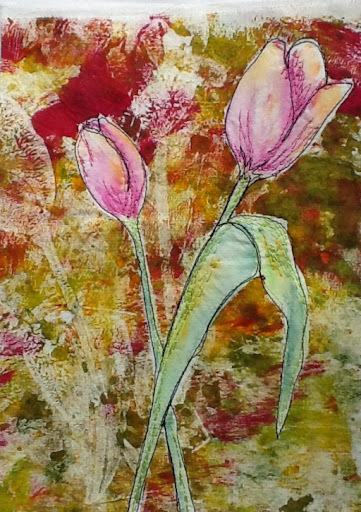 I'm thinking of doing a small work in fabric as a diversion from my usual work of late with Gelli prints. I've been wanting to try a few more landscapes for a while. The weekend weather is going to be lovely though, so I don't expect to spend much time at home or indoors. Also, I'm planning to make a batch of relish on Monday. I'm leaving Friday for my trip to Oakville; not sure how much I'll sew this week, but it's fun to spend time in one's head percolating a new idea. My current contemplations are should I paint the entire scene onto white cotton and then thread paint, or shall I paint and add some fabric collage elements? I don't plan to work large, and I'll likely experiment with a few methods. I'm a bit rusty in my sky painting and may have to make a few tries. I'm happy to have found a new spark of an idea though and plan to go back with my better camera tomorrow for more detailed photos. Shortly, the leaves will be turning and the scene will change colors. This will give me lots of fodder to dream about while I'm away. Oh my goodness, we are having another hot, muggy day today! I had an early start with a blood test and have spent the rest of the day inside. I've just made a half sized blueberry crumble which I'm baking in the little toaster oven. 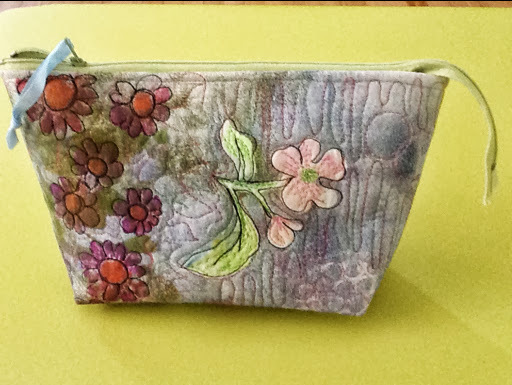 I managed a bit of cleaning and ironing in my sewing room before sitting down to finish another zippered pouch, the last one planned for a while. The only thing remaining is to add the tab to the zipper. 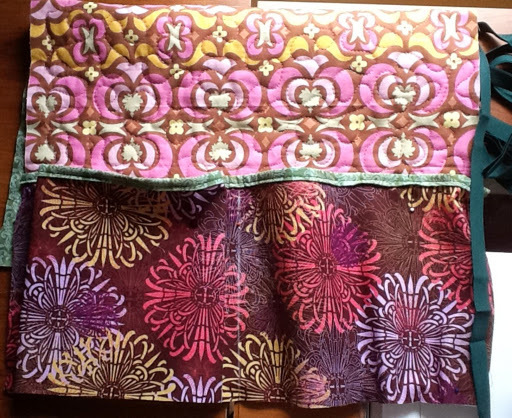 I used the same fabric for the lining as the back. Here are the 3 together. I've just made myself a cup of tea-- I can always drink that, no matter how hot outside-- and I'm going to watch the end of the DVD Soy Wax Inspirations by Susan Purney Mark. I've got the fan wafting air back and forth and I'm doing a little hand stitching with pearl cotton, outlining leaf shapes on my natural dyed t shirt. We got home last night from our Lunenburg trip where we visited my son and his wife. It wasn't a fun trip home in 28C temperatures when our air conditioning wouldn't work, but we survived. Once again we were blessed with a sunny weekend. Our first evening after a supper of barbecued mackerel and veggies, we took a little stroll on the waterfront. 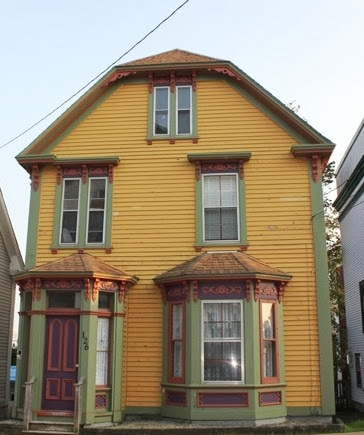 All of the houses are so colourful and have such a great distinctive historical style. 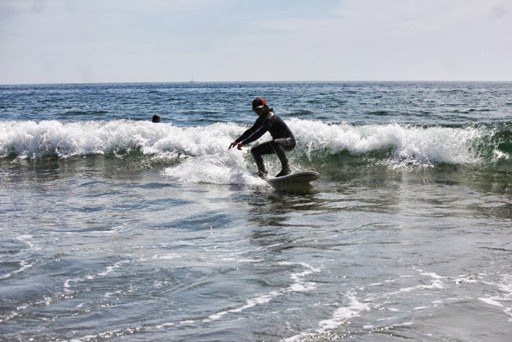 We went to the beach both days as we wanted to play in the ocean and see my son surf, a new sport for him. The waves weren't huge but were big enough to get going a bit. The Atlantic Ocean is pretty cold and a lot of people had wet suits, even the boogie boarders. I had an armless wetsuit from my kayaking days and I wore it in as well. It was just enough to keep me warm. The second day, I saw a couple of women about my age come down in wetsuits with boogie boards. It was a really beautiful beach. 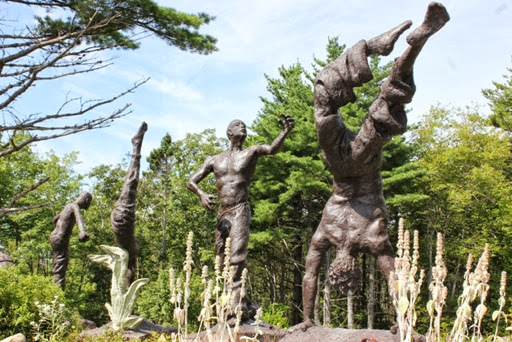 The second morning we took a little trip to a garden Center called Cosby's in Liverpool where there were some pretty walking trails featuring these really awesome concrete sculptures. These were larger than life size all done with sculpted concrete. The one below was the most recent and we were told it weighs 4 tons! It's about 10 feet tall! 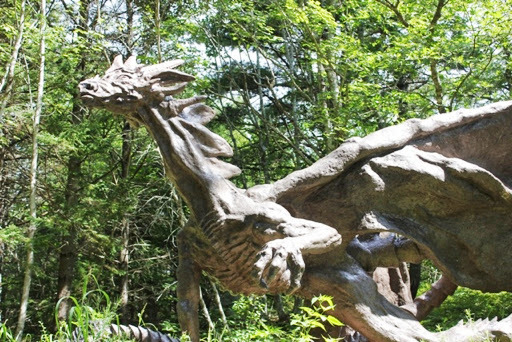 They're sculpted in a greenhouse and then moved into place. Imagine! The one above is the back view of the figures. It's hard to believe he can get such detail with concrete. There were about a dozen or so sculptures in all, quite breath taking and quite a body of work. We will next see my son and his wife at Christmas when my daughter comes home from S Korea. Something to look forward to. 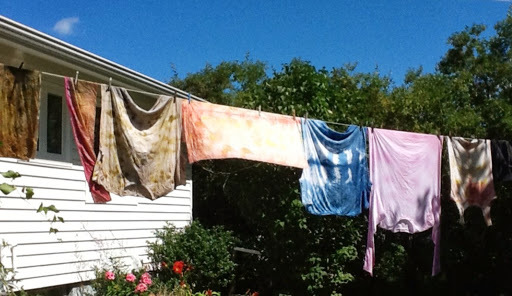 I unwrapped my final pieces from the natural dyeing workshop this morning and hung them on the line to dry. Once dry after lunch, I washed them and hung them out again. I'm a little disappointed that the long sleeved T-shirt lost a lot of the cochineal color but on the whole I'm pretty pleased. Maybe ill redye it for fun at some point. They all look so pretty on the line. The silk scarf and the silk de chene definitely have the most saturated color. 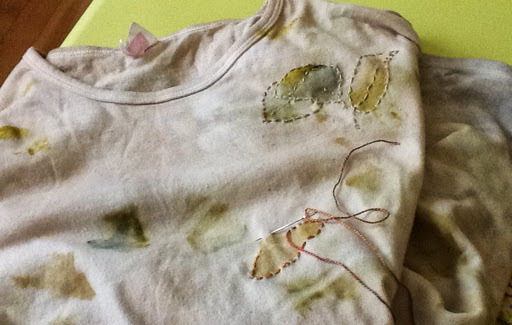 I did a little cotton camisole with leaves, and tansy, soaked in a madder bath. It's quite pretty too although the madder didn't soak through the layers very well. It's all a surprise when you unwrap and you learn with experience. I think the little block of color is quite interesting. There is actually a bit more color than the photo shows. 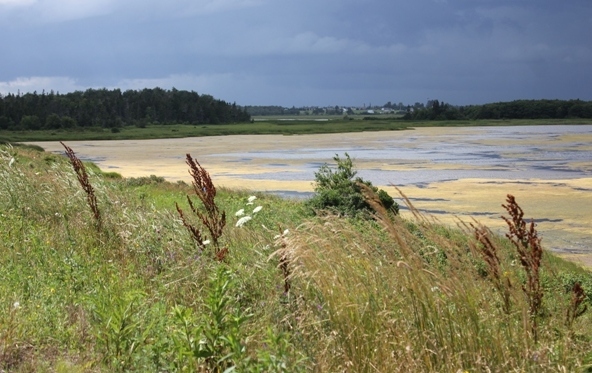 For some reason the lime greens do not pick up well with the camera. Besides washing clothes, I've been getting ready for our Lunenburg trip, so I've taken just a bit of time to quilt the front and back pieces for the next pouch. I practiced a feather again on the back and got one side of the zipper basted in, but that's it for today. I may be away from the blog until later next week. 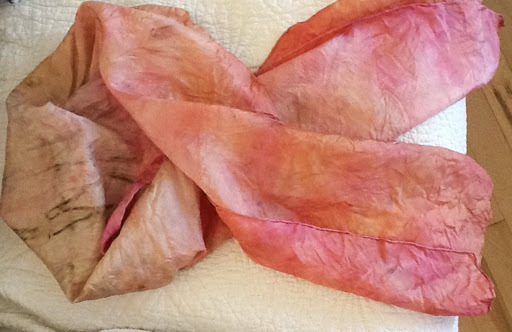 I've been having a wonderful 2 days at a natural dyeing workshop! We started yesterday with leaves and wildflowers which we rolled into crepe de chine, silk, cotton and wool and then put into a steaming bath with alum. 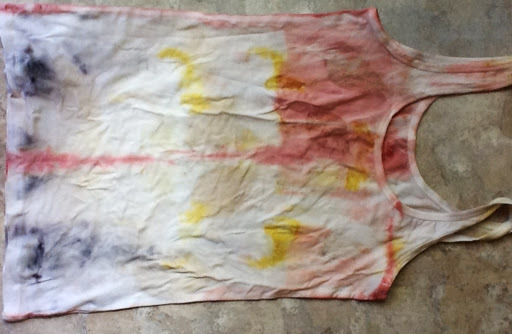 There's actually a bit more color than the picture shows in the natural T-shirt. I may slit the front and add some hand stitching to it eventually. The dark you see on the T-shirt above was a rusty spike. 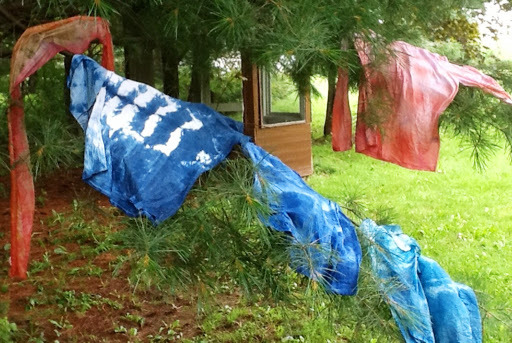 Today, we did some indigo dyeing and I over dyed a silk scarf from yesterday in a cochineal bath. The scarf is on the left and my T-shirt is the blue one on the left. The pink shirt above right is also mine. One lady brought a lot of her clothes to dye. They look so beautiful fluttering in the pines. 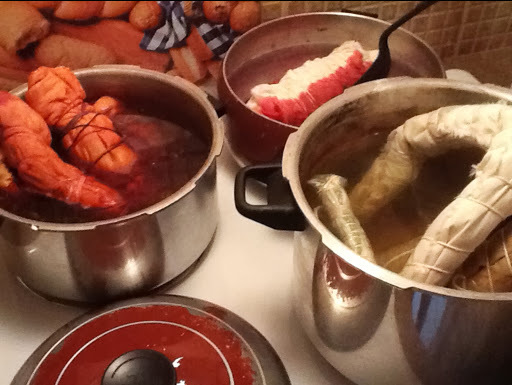 These are the pots simmering with madder. The front one is just water with natural plant materials. Once everything is washed and dry I'll have some final photos. This is going to be a busy week for me. 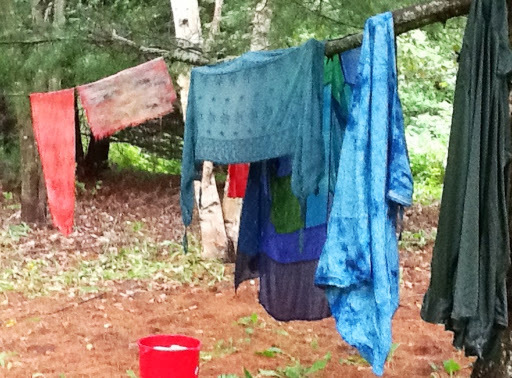 I'm taking a 2 day natural dyeing workshop starting later this afternoon and all day tomorrow. 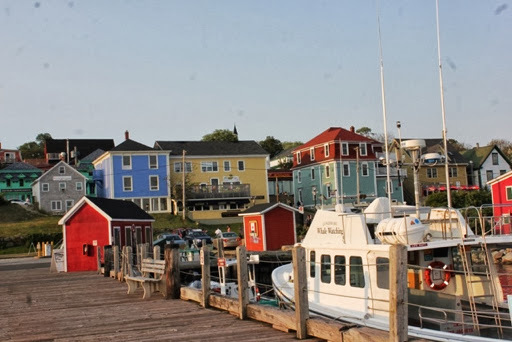 Then I'll have 2 days to rest and pack for our trip to Lunenburg NS to visit my son and wife. This morning I started with a relaxing cup of tea and the crossword while waiting for the wash To finish up and hang it out. Then I made muffins with fresh rhubarb from the garden. 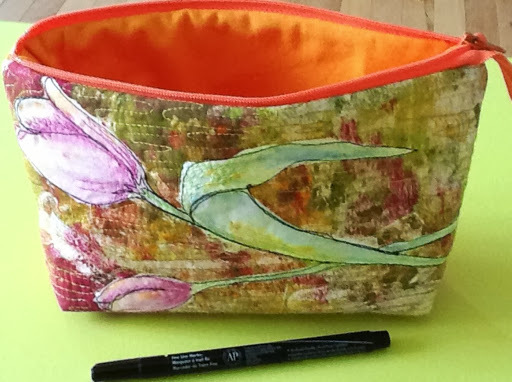 I was looking for a little sewing project and pulled out another Gelli print to free motion stitch. 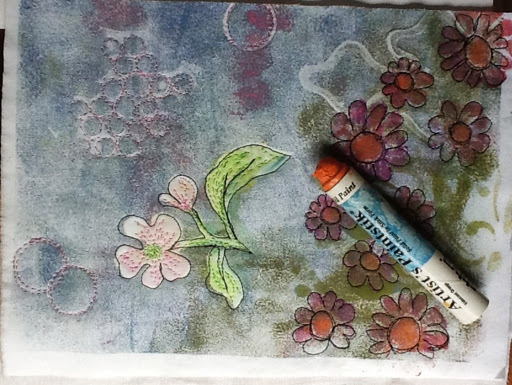 I added a touch of color with Neocolor II crayons on the flower blossom and then thread. I added the Shiva Paintsticks to the flower centres. 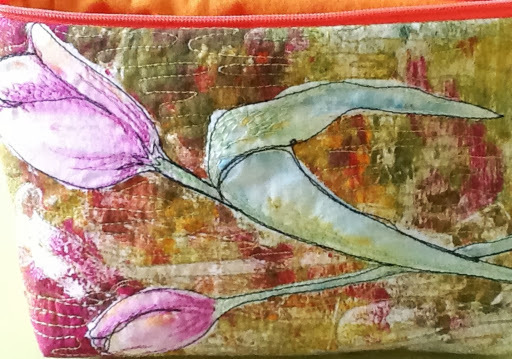 This is going to be another zippered pouch. I still having fun using up prints from my stash. It will also be nice to have them set aside for future gifts. I've chosen and sandwiched the back fabric as well. I'm sitting with my feet up taking a little rest before we go to the golf course. There's quite a breeze blowing; it's lovely and cool and I'm listening to the tinkling water in my fountain on the deck. Friday supper time I heard all this ruckus of peeping in the yard and noticed a family of gold finches at the feeder . All of the babies save one seemed to have mastered pecking the tiny seeds from the gridded finch feeder. It tried but was only pecking where it was empty, and so gave up and went back to flapping its wings and peeping noisily on the deck rail. 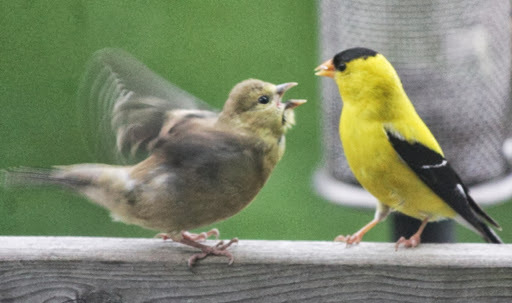 I waited patiently for about 5 minutes or so for the male to come give it some seeds. It seemed to be only the male doing the feeding. 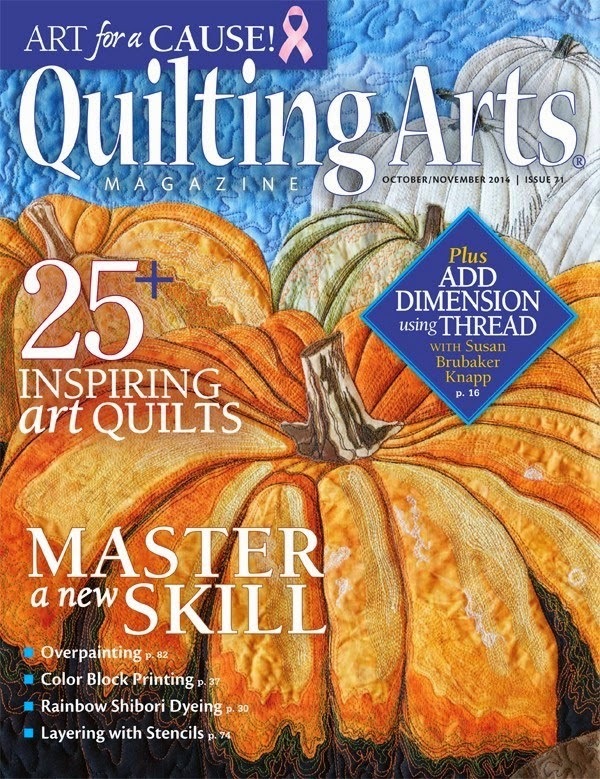 I'm so excited to let you know that I have an article coming out in the 2013/2014 Quilting Arts Gifts magazine scheduled to hit the stands August 27th. Check it out here. 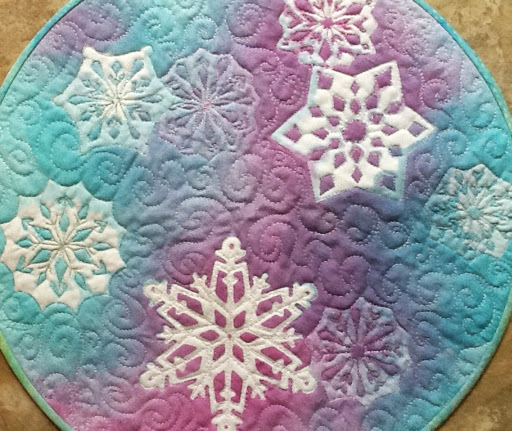 It features directions for how I made and stencilled the snowflakes on my table topper. I can't wait to get my copy! I'm in gift making mode. Yesterday, I cut the pieces out for an over the sofa or chair arm quilted caddy that you see below. I've just added the binding edge to the top of the pocket and stipple quilted the main section. The pocket section is pinned to the back ready for next time. 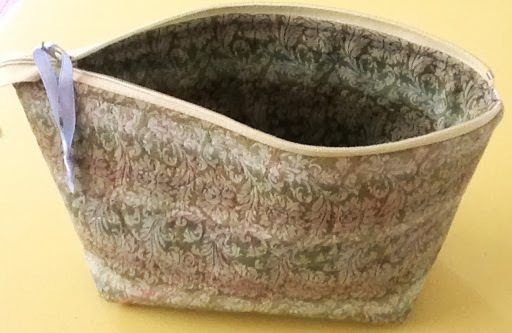 It's described as a sewing caddy but it would be good for anything including glasses, remote, crossword puzzle book etc. After a day of rain, we have another beautiful sunny day, although I think it must be humid as I've been sweating all morning. I went to the market, did a few odds and ends at home while my husband is golfing. I'm hoping that after a rest, he'll feel like going to the beach and taking supper with us. I've made a corn and black bean salad. 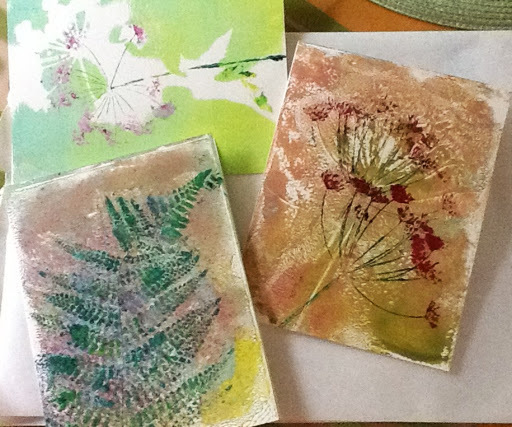 Last night, I was feeling like doing something a little different, so I got out my paints, the printing Gelli and some blank cards. I have a few old phone books where I press flowers and leaves over the summer months. 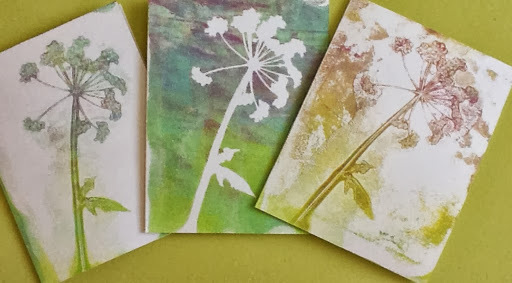 I used Queen Anne's Lace for these. The ones with the off white background are the 'ghost' prints. 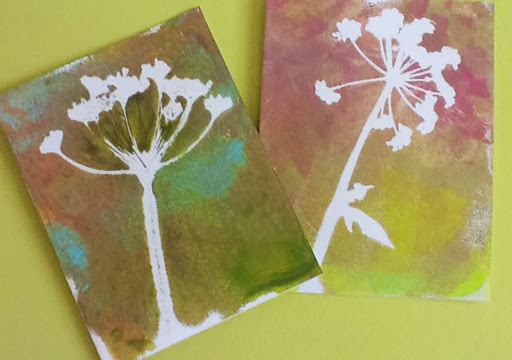 The left card in the next shot was done with a piece of pressed Allium. 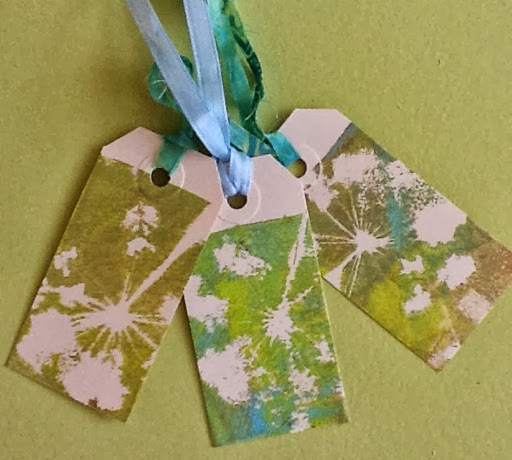 There were unused areas left on the Gelli so I pulled some little tags. I even used deli paper to print up the leftover bits. 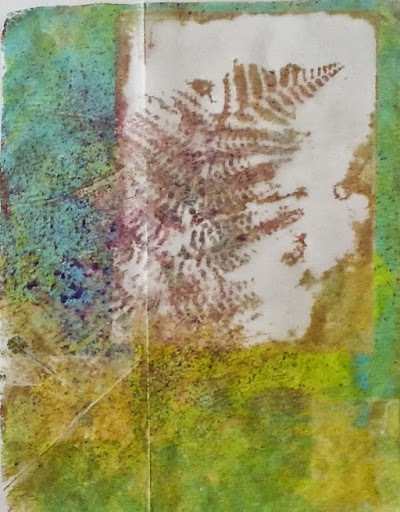 This one is a ghost print from a fern. It is so pretty that I think I must get some fabric ready for the next session. I'll glue this to a sketchbook page sometime or maybe even a canvas. I missed my swim at the spa yesterday as I didn't feel up to it, so I went this morning. I spent my few hours at the shop in the afternoon. Sometimes it's too much for me in one day. 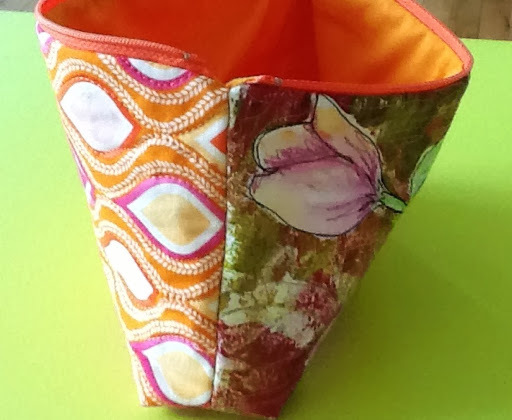 This afternoon even though the birds kept distracting me and tempting me to grab the camera as I sat at my machine facing the window and a view of my yard, I managed to finish quilting the pieces for another zippered pouch and get it together. 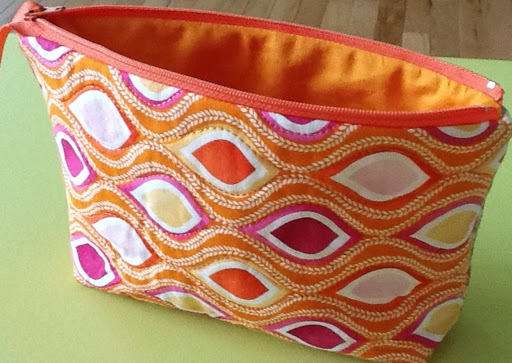 It just remains for me to top stitch the zippered edge and add a tab. This one is a bit smaller than the last one. I've added the pen for reference. I'm pretty happy with how the tulip turned out and I love the back fabric! Now, I'm off to make a small snack and a cup of tea before its time to start dinner. The best day, painting and thread painting. Oh, I love these kinds of days! It's sunny and warm but not too warm or humid, comfortable. I was lazy about getting up and going this morning. I'm always tired after a trip. I Skyped with my daughter who's in S Korea and then I walked to the coffee shop to meet some friends. 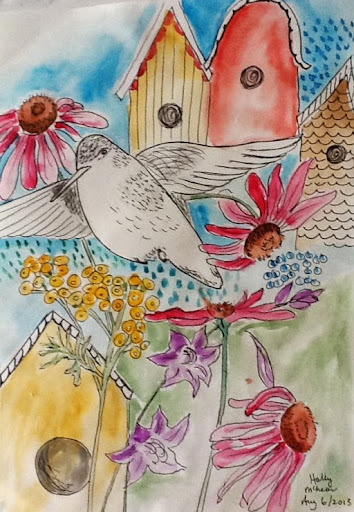 Before lunch, I started an exercise from Alicia Burke's online Summersketch course. The topic is 'whimsical' which something a bit out of my comfort zone, but I had a go at it. I see some changes I could make to it. Perhaps I'll try this again. It's fun. At lunchtime I mixed up a small potato salad from PEI potatoes and made some zucchini patties to cook for dinner. 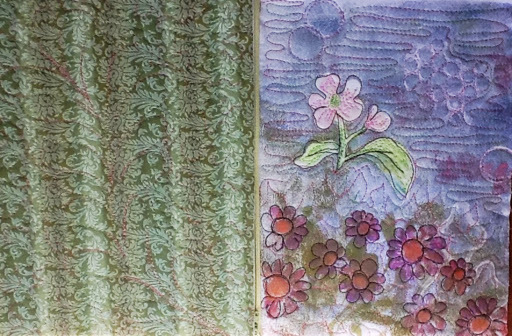 I pulled out one of my Gelli prints from the spring, backed it with stabilizer, added some Neocolor II crayons, and a bit of free motion stitching. This is going to be another small zippered pouch. They're fun to do and I'd like to have some on hand for gifts. 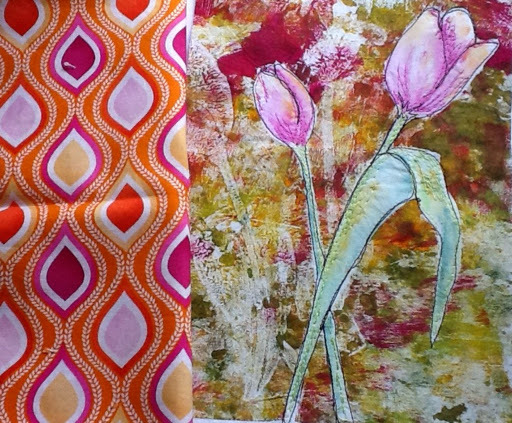 I'm thinking the fabric on left might be good for the back of the bag. A perhaps dismal forecast for our long weekend turned out to be spectacular. One just can't always listen to the weather person. We did hit two rather nasty bits of weather on our way home, a thunder and lightning storm with a torrent of rain and hail. Many cars and trailers were pulled over including us, and at one point, I feared for our windshield the hail hit so hard. Here is a shot of the approaching storm. 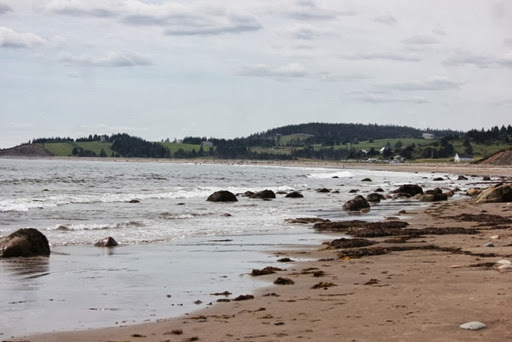 We spent two glorious days at the beach near my family's cottage while on Prince Edward Island. For anyone who has never visited it is sure worth a trip. 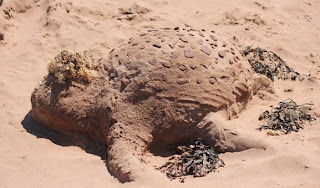 When it is warm and sunny the beaches and waters are truly wonderful! I really did go for a swim, several times! See? It's the only way i want to be photographed, underwater! I was swimming just near the point below. 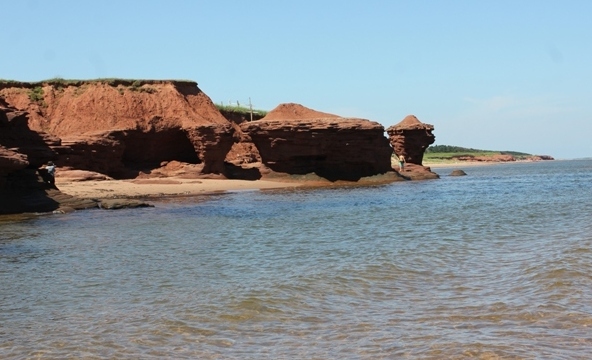 The red sands, and limestone shorelines are spectacular. This one looks like a flower pot now but a few years ago we used to call it the elephant. That is the only problem with soft limestone and rising waters. It erodes easily. There is always a sand sculpture or two to be found. I'm home now but will have wonderful memories of family, food, barbecues, lots of gab and laughter, sand and sea. We even squeezed in a little golf game and dinner with my mother and her husband. She's 77 and he's 79!